Video: 2015, Year of Crisis and Military Escalation. What to Expect in 2016? 2015 was marked by a series of crucial diplomatic and military developments in the world. The old world order established after the Cold War is rapidly changing. Russia, China, and Iran have become the main forces openly making steps to change the global system. In turn, the US-led block is seeking to retain the old world order by any means. The clash of interests in crisis regions around the world is engendering a serious escalation. Even if 2015 was successful for Russian and Iranian diplomacy, the situation remains complicated on the ground. While neither of the main world crises have been resolved or is there any expectation that they will be resolved in the nearest future, it is possible to summarize provisional results of the year. The European migration crisis is especial acute. Since 2013, a cruel competition has been going among migrants, European governments and local societies. Immigrants concentrated in the entry point states move to the countries of the Central Europe (Germany, France) and the North Europe (United Kingdom, Sweden, Norway), spread over the whole union. The European governments impacted by critical look of the public opinion and the economic crisis have been trying to stop this process using the more and more gray approaches based on the wide notion of nation security concepts and the disregarding of human rights. However, the para-military operations in the Mediterranean sea and the usage of unadapted camps only conducts an additional exacerbation of migrants often pushed from their homes by the circumstances of insuperable force. In turn, inability of governments to solve the ongoing crisis conducts the anger of European citizens and contributes to the growth of radical parties and movements. Thus, the migration crisis has also triggered additional disputes between the national elites and European bureaucracy. European nations are faced with a dilemma: to surrender under the pressure of the main European powers and the eurocracy or try to defend what remains of their unique national sovereignty. The projects as the National Front Party, Marine Le Pen, aspires to renew its own national goals are strongly opposed by the mainstream European establishment. Separately, the Russian military operation in Syria marked a loss of the US’s monopoly on the recourse to force. Now, the US and its partners are lossing the leadership in the Middle East region. The success of the alternative anti-ISIS coalition will mean that the US could lose the leadership in a great part of the world, in Eurasia. For Western-backed states as Turkey and Saudi Arabia it means decrease of their influence in the region. The borders between the Central Asian states and Afghanistan have become increasingly active in terms of militant, diplomatic and security activity. Militant activity has increased in northern Afghanistan in recent months, punctuated by Taliban forces’ capture of the town of Kunduz in late September and ISIS militants have been gathering momentum and concentrating there. ISIS militants see this region as a foothold for further expansion into Central Asia. The important fact is they don’t fight foreign or Afghan government troops. They conserve and gather strength. The threat is also growing in the South. The number of ISIS militants has been growing at the borders of Tajikistan and Turkmenistan amid serious domestic problems of the Central Asian states. The tensions in the South China Sea is a visible part of the ongoing US-China standoff in the Asia-Pacific region. The Obama’s “pivot to Asia” and the US newly released maritime strategy de facto mean that the Washington has taken a course on a long-standing countering of the China’s influence in the region. A core but often unstated component of U.S. national strategy is to maintain global superiority at sea. By controlling the seas, the United States is able to deploy military power and to control the movement goods worldwide. 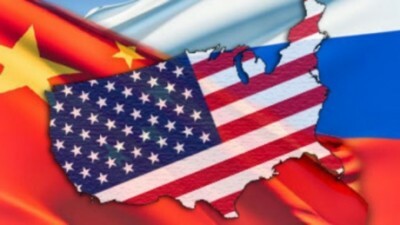 In the Indo-Asia-Pacific region the US has been rapidly building political, economic and military alliances to balance the raise of the China’s economic and military power. Beijing can’t ignore this fact. The China’s strategy maritime strategy aimed to defend its eastern coastal area and crucial maritime routes in the Indian Ocean challenges the American approach. Another hot point in the region is the Korean Peninsula. 2015 was marked by a new standoff between the North and South along the Demilitarized Zone conducting a complicated environment. The situation is further challenged by an aggressive South Korean stance supported by the US. According to Korean military sources the US has been considering to dispatch B-52 or a B-2 Spirit stealth bomber and a nuclear-powered submarine currently stationed at Japan’s Yokosuka naval base. The US has previously dispatched its military assets to the peninsula to support Seoul in its stand-off with Pyongyang two years ago. In April 2013 it had flown B-2 stealth bombers. The tensions in the Korean Peninsula will be definitely used in the ongoing US-China dispute for the leadership in the Asia-Pacific. Generally, 2015 was a year of crisis escalation and a fresh source of tension in international relations. The main directions of aggravation of the international situation have come into full force. However, last year was only the beginning when the system of international relations started to rebuild. Unfortunately, international practice revealed that global actors were not able to cooperate fruitfully to overcome mounting differences. The establishment took on the usual clannish spirit and protected the corporate interests of the crony elites, while the election race in the United States and the deepening economic recession fueled the flame. The entire year was steeped in the smell of gunpowder, but had not yet enveloped the world in the smoke of a global war.